In the past few months, the effects of climate change have become even more apparent. I just returned to Boston College from Seattle, a city known for its moisture, that went a record-setting 55 days without rain this summer. My anxiety-prone mother is constantly nervous about natural disasters and survival preparation, and in light of the recent super-storms shocking our country, I think we should all be a bit more worried. We know now that climate change intensifies already destructive storms that occur naturally. Greenhouse gases cause heat to get trapped near the earth’s surface, warming the air and raising the temperature of the ocean at the surface level. Tropical storms feed off that warmth, becoming more intense, larger, and longer lasting, according to Kevin Trenberth, senior scientist at the U.S. National Center for Atmospheric Research. We saw this with Hurricane Harvey, which quickly progressed from a tropical depression into a category 4 hurricane. Because we as humans tend to be self-centered, many people’s immediate response to our changing climate is wondering how it will affect “me.” I’ve got news. Climate change and the resulting intensified storms and precipitation events will most definitely affect us in Boston, and certainly within the BC community. This past summer, heavy rain led to flash flooding throughout Boston, washing out roads and leaving many people stranded. It is likely that intense weather like this will become more common. The 2011 Massachusetts Climate Change Adaptation Report predicts increased precipitation and flooding, as well as an increase in extreme weather events. Many scientists, including Paul Kirshen of the UMass Boston School for the Environment, predict that Boston will experience more rampant flooding in the coming decades, resulting from rising sea levels and stronger storms. This is especially problematic because Boston is situated in a topographic lowland, the Boston Basin, surrounded by a ring of hills. Kirshen, head of the Sustainable Solutions Lab at Umass Boston, is now researching the feasibility of a massive hurricane barrier, and whether it could protect Boston and its surrounding communities from flooding. BC is pretty far from the coastline, but if the city of Boston is already preparing to defend against changing weather patterns, perhaps we should too, as the problem is only going to get worse. Even if BC is not willing to divest from fossil fuels and help stop the perpetuation of global warming, the least it can do is prepare for when the weather gets bad. We’ve all noticed how mucky Lower Campus gets during heavy storms and when the snow melts in the spring. This flooding has been well documented over the years. For example, after a rain storm in 2012, The Heights reported flooding in and around the Mod Lot, with some water entering parts of the ground floor of Maloney Hall. In 2014, BC men’s basketball tweeted this photo of a flooded Lower Campus. This is not surprising considering the fact that Lower Campus is topographically much lower than the rest of campus, and was part of a smaller reservoir until 1957, when construction began to fill in the area. 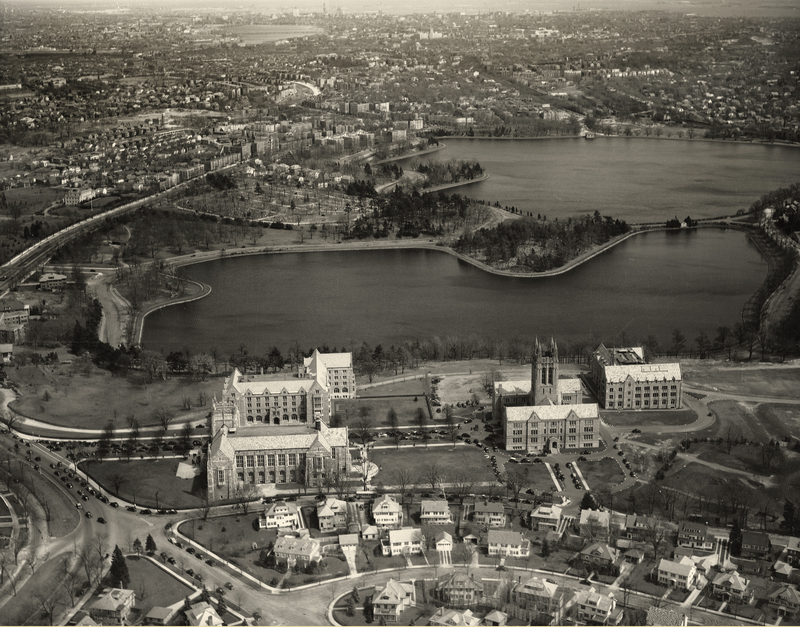 Perhaps you have seen this image of what Lower Campus used to look like. According to the city of Boston’s Open Space and Recreation Plan for 2015-21, which includes a map of flood zones in the city of Boston, the area in and around the Chestnut Hill Reservoir is known as a flood hazard area, or a 100-year-floodplain. This means that a flood event has a 1 percent chance of occurring in any given year. Many of the flood hazard areas on the map are found within protected open spaces, areas without buildings, ensuring that development in these areas, if any, will be limited. But at Lower Campus, near the flood zone, BC has started new construction projects including a 200,000 square-foot student recreation complex, and a 285,000 square-foot university center. Urban land, land that is 85 percent or more covered by impermeable surfaces such as concrete and asphalt, has less capacity to store rainfall and snowmelt. The proposed new Field House on Lower Campus, in what may be a flood-prone area, will replace the grassy land of the baseball and softball fields with urban land, making it more vulnerable to flooding. I read the Project Notification Form for the new Field House, and I was pleased to find that the new construction will incorporate sustainable design and construction principles. Since 2006, the University has experienced a 20-percent reduction in greenhouse gas (GHG) emissions from stationary carbon sources. According to the form, the project site is outside of the 100-year floodplain associated with the Chestnut Hill Reservoir, so the project is not anticipated to be susceptible to conditions of flooding or predicted sea level rise. Additionally, on-site stormwater retention systems and filtration will be employed to accommodate severe rain events. Various consultants have evaluated the BC campus and found that the most prominent contributor to flooding is runoff from the surrounding elevated areas on campus. Looking forward, as climate change intensifies storms, Lower Campus will need better systems to deal with more severe flooding events. These new buildings will need rain barrels to capture roof runoff, water that can then be redirected and used for grounds maintenance. After all, we know how much BC loves to water its grass! I’d like to see more “green” roof installations, rooftop gardens with native species. This will help control runoff flows and reduce building energy needs. BC should use porous pavement and loose material instead of asphalt in its construction pavements. Much of these ideas have already been proposed, but I truly hope that BC follows through with these preparations against future damage. All I’m saying is we should all definitely be worried about climate change. Though it may seem that these storms and droughts are occurring solely in other places, adverse weather will undoubtedly eventually affect all of us. Maybe I’m paranoid, but it’s always better to be prepared. If you only care about how climate change will affect you, then picture a vicious, murky flood sweeping the Mods away and up Commonwealth Ave. Maybe that will get our school to think seriously about climate change.